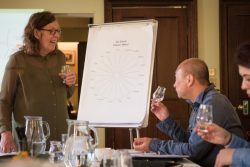 Yes guys Gintime editor Geraldine Coates is now the Gin Prof having joined forces with the Edinburgh Whisky Academy to launch the first accredited Diploma in Gin last week. The course was a great success and we welcomed enthusiastic consumers, as well as candidates from the Gin industry. The day included a tour of the Edinburgh Gin distillery nearby, where our participants saw their new knowledge put into action. A terrific feature of the programme is the Guest Distiller slot that invites different Master Distillers to explain their own unique ways of doing things. This time it was filled by Tom Nichol, the legend behind Tanqueray 10. For the May Diploma we are looking forward to welcoming Jamie Baxter who has designed more new distilleries in the UK than anyone else in the world. In conjunction with the SQA awarded Gin Diploma, we also launched our Botanicals Workshop. Candidates experienced a fascinating, fun and interactive morning learning about herbs and botanicals from expert Hamish Martin of The Secret Garden just outside Edinburgh.